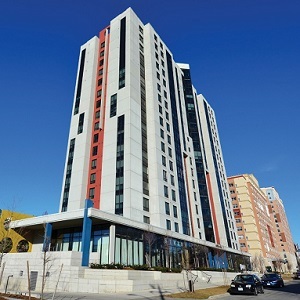 Alignvest Student Housing REIT has made its first acquisition as it sets out to consolidate what its managing partner calls a highly fragmented Canadian purpose-built student accommodation real estate sector. Alignvest managing partner Sanjil Shah said most purpose-built student accommodations in Canada are owned by local developers and investors. He added major Canadian institutional investors have put money into the sector mainly in other countries. “In Canada they would have to do all of the heavy lifting of consolidating these assets and writing cheques of $20 million at a time and building the business,” Shah said. “This is not a passive real estate play where you’re just acquiring assets and they run on their own. “This is a really operationally intensive business and you have to have true property management where you have to manage your leasing functions, your student experience and local issues in each university community. Canadian university enrollment is increasing and post-secondary education is seen as recession-resistant. Limited funding available to universities is decreasing their ability to provide additional beds to service the increase in demand by domestic and international students. Students sign 12-month leases, with the option to sublet their units over the summer, and generally stay for two or three years. Shah said this provides a natural turnover of about 40 per cent, which allows a healthy rotation of students coming in every year and the ability to reset rents. Alignvest Student Housing REIT’s initial focus is on Southwestern Ontario, which has six universities with at least 10,000 students: University of Waterloo and Wilfrid Laurier University in Waterloo; Western University in London; McMaster University in Hamilton; University of Guelph in Guelph; and Brock University in St. Catharines. Alignvest Student Housing REIT will seek to acquire properties in the region — then integrate them and build an infrastructure to create scale — before looking more seriously across the rest of Canada. The goal is to create a platform large enough to attract interest from institutional investors over the next three to five years. The first acquisition is a 455-bed building at 181 Lester St. in Waterloo called myREZ on Lester that’s 99 per cent occupied. Shah said the REIT expects to announce at least one, and possibly two or three additional acquisitions this summer. Shah said Alignvest is targeting an initial six per cent annual distribution to investors, but he expects it will increase to a long-term 15 per cent aggregate annual return — including anticipated increases in the value of the assets. As such, he said real estate values are too high in Vancouver and Toronto and the math doesn’t make sense to purchase properties in those cities. While Alignvest will initially focus on acquiring existing properties since it presents the fastest and easiest path to consolidation, Shah said it has had discussions with potential development partners to add to its property pipeline in the longer term. Alignvest Student Housing REIT is a division of Toronto-based Alignvest Management Corporation, which launched in 2011 as an alternative investment management firm for its clients, which include pension plans, foundations and ultra-high-net-worth family offices. “Alignvest’s partners put capital into every deal we do,” said Shah. “We’re always a first investor and we’re typically one of the largest investors in every deal we do. Alignvest Student Housing REIT initially set out to raise $20 million for its first acquisition. However, investor demand was overwhelming and it capped the amount of cash taken in at $50 million. Some investors were asked to defer their funding until it could be deployed more effectively, and it launched with more than $65 million in capital commitments. Shah is also a founding partner and chief financial officer of the parent company and was previously CFO and chief operating officer of StorageNow, a niche real estate business which consolidated part of the Canadian self-storage real estate sector. * and Jonathan Turnbull, an Alignvest Student Housing REIT managing partner who founded Dundee Private Equity.